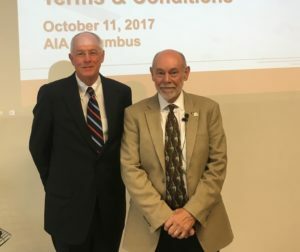 David Patterson teamed up with Eric Pempus of DesignPro Insurance Group for the first of three presentations for architects and engineers on the topic of Allocating Risks through Professional Practice Management and Contract Terms & Conditions. The first program was held today at the American Institute of Architects’ Columbus office. The program will be repeated on November 1 in Cincinnati and November 2 in Kent. Essentials in risk management and professional practice that include: 1) risk avoidance; 2) risk allocation; and 3) risk reduction in professional practice. Identify contract essentials in their professional agreements with clients and consultants that includes written vs. verbal agreements, available forms of agreements and the all-important scope of services. Three most critical and troublesome risk management topics in professional practice: 1) project owners expecting that their A/E must comply with all laws, rules and regulations; 2) professionals being required to provide certifications, guarantees, and warranties for their professional services; and 3) onerous contract clauses requiring an A/E to indemnify and defend their client that may void the professional’s professional liability insurance coverage. Do’s and Don’ts in their professional practices that include proper project documentation and words to avoid in their contract terms and conditions. Additional information about the upcoming programs can be found on the attached document.